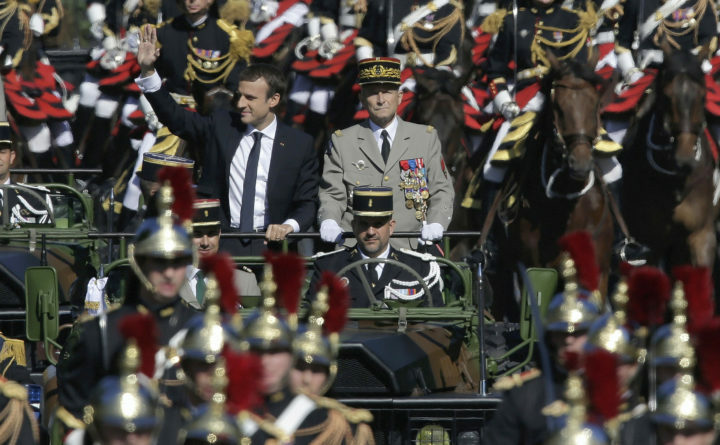 In this July 14, 2017 file photo, French President Emmanuel Macron, left, and Chief of the Defense Staff Gen. Pierre de Villiers, right, drive down the Champs Elysees avenue during Bastille Day parade in Paris. President Donald Trump has said he would like to stage a military paradein Washington, D.C.
A military parade down one of Washington’s broad avenues would seem to epitomize so much that is great about the United States, from the fine fiber of our troops to the might of their fighting machines. Such a spectacle — reportedly ordered by President Donald Trump in a meeting last month with the top brass — would offer a stark contrast to the nation’s current woes and divisions. Trump ordered up the parade after being impressed by the pageantry of a French military parade for Bastille Day that he attended last summer in Paris. To be fair, the French have always had a flair for such things, and they’ve been doing them for more than a century; the 2017 parade was a dazzling display of martial pomp, tailored by French President Emmanuel Macron to flatter Trump by also commemorating the 100th anniversary of the United States’ entry into World War I. The parade worked its magic on Trump, who tweeted how it was a “great honor to represent the United States at the magnificent #BastilleDay parade,” and he came home with visions of American troops marching through the streets. France paraded about 6,500 soldiers before Trump, representing a little more than 3 percent of the 209,000 personnel in their active armed forces. The active U.S. military is more than six times the size of France’s, and its reserves are nearly 40 times as large. So a proportionate show of force would include 40,000 U.S. troops (roughly two entire Army or Marine divisions) — a larger parade than any here since the Civil War. Military parades celebrating the end of World War II and the 1991 Persian Gulf War included 13,000 and 8,800 troops, respectively, still larger than the French parade that so impressed Trump but far short of the massive martial displays in foreign capitals such as Moscow or Beijing. If my experience as an American soldier is a guide, though, most troops don’t relish the idea of marching in parades, let alone the endless days of rehearsals that go into making such events shine. Marching serves a purpose in basic training: To indoctrinate personnel and condition them to following orders, holding themselves with military bearing and working as a team. But in the real military, after basic training, marching in parades is a distraction from more valuable training that can save lives in combat. There’s also the awkward question of what, exactly, the parade would be celebrating. Our military remains engaged in two very long-running, uncertain and potentially unwinnable wars. A sharp divide has emerged between the troops serving in these wars and the 3 million veterans they’ve produced and the rest of the nation’s citizens, who are now largely oblivious to the battles being waged in their name. Parading troops through Washington will neither bridge that divide nor help achieve success in these wars. Yes, the U.S. military can spare 6,000 troops — or even 40,000 — out of more than 2 million active and reserve service members. Indeed, the military has tens of thousands of active personnel within a couple hours’ drive of Washington, serving in the Pentagon and at bases such as Quantico, Fort Meade, Langley Air Force Base or the Naval Academy. The Army and Marines even have units assigned permanently to Washington, where they guard the Tomb of the Unknowns and perform other ceremonial duties in the capital. Any of them could be ordered to show up and march in formation. But an army of staff officers and specialists from all those other installations would need to practice to march well, and such an army would hardly impress the president, especially this president. And while they marched, their important real jobs would go undone. Instead, the Pentagon could bring fighting units such as the Army’s 82nd Airborne Division or the Marines’ 2nd Marine Division — both stationed in North Carolina — to march in Washington. Or the tank-heavy 3rd Infantry Division from Fort Stewart, near Savannah, Georgia. But every single fighting unit in the U.S. military is either currently deployed, just recently returned from combat or getting ready to deploy again. Sending these fighting troops to a parade would disrupt the careful schedule of training, deployments, schooling and rest that is critical to their battlefield performance. A parade would not be easy or cost-free, either, especially if Trump wants to see tanks and artillery pieces rolling along with marching troops. Heavy armored vehicles can’t just drive from places such as Fort Knox, Kentucky, to Washington on the interstate. These vehicles are designed for short movements in combat; they break when forced to travel long distances. So either the Pentagon could order these vehicles be driven to Washington — in which case many would break and be unfit for their real purpose — or they would need to be moved by rail or heavy truck. Either way, the moves would cost millions of dollars and tie up this gear for weeks that could have otherwise been spent using it to train for war. The gulf between our self-selecting warrior caste and the rest of society has arguably never been greater, and there are indications that this split is affecting military recruiting and readiness. But neither our military nor our country needs the spectacle of a parade to better appreciate the service of our troops — especially one that will deplete scarce military resources at a time the Pentagon is preparing for potential conflicts with China, Russia and North Korea in addition to the engagements we’re already in. If Trump wants to see how great our troops are, he should visit them in training — or better yet, visit them in Iraq or Afghanistan, where they are fighting (and sometimes dying) on his orders. Phillip Carter is a former Army officer and Iraq veteran who directs the veterans research program at the Center for a New American Security.